After dropping the first game of the key four-game series in frustrating fashion, the Dodgers tried to even the series against the Diamondbacks tonight. The pitching was quality again, and the process of hitting the ball hard was actually solid early, but what they needed was results. Thankfully, they eventually got that with a pair of homers late in a 3-2 win. Hyun-Jin Ryu‘s night started ominously, as three batters into the game the Dodgers were down 2-0 thanks to an infield single and a Paul Goldschmidt liner down the line in right. Fortunately, that was not all indicative of how Ryu’s night would go, as those were the only runs he would give up over seven strong innings. I dunno man, he continues to look like his pre-surgeries self. Regardless, it was the offense that was the problem again. Facing Zack Greinke they were limited to two prime scoring chances. In the 2nd, they stranded a lead-off double. Then in the 3rd, they scratched something across the plate. Yasiel Puig singled to start, was bunted to second by Ryu, and then advanced to third on a wild pitch. 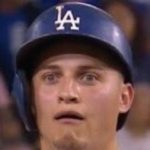 Joc Pederson then came up with the big hit that’s been missing with a runner in scoring position, singling sharply to right to drive in a run and cut the lead in half. 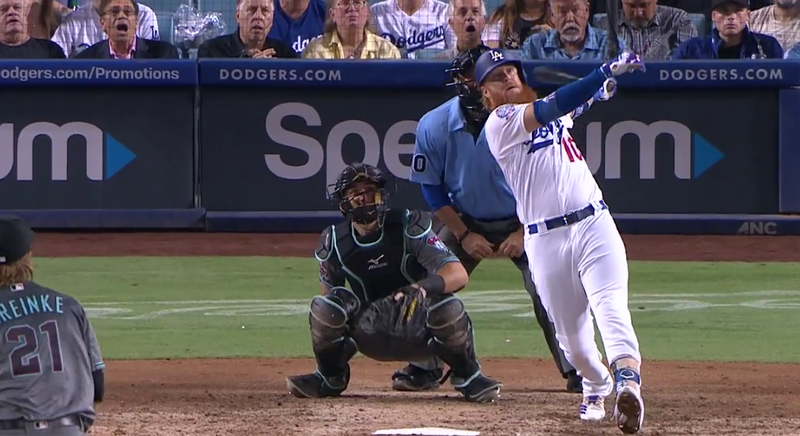 Justin Turner then followed by blooping one to left to put men on first and second, but the Dodgers couldn’t capitalize. And it wasn’t necessarily their fault early on either, as the Dodgers lost at least a few hits in the first four innings to basically hitting liners right at guys. Still, Ryu’s outing bought the offense time to get back into it, and thankfully they finally did with two outs in the 7th due to the guy pinch-hitting for Ryu. Enrique Hernandez stepped up and went the other way for his 19th dong of the year to tie the game. Dylan Floro was then trusted to get the 8th himself, and despite a runner advancing to third on a infield single, bunt, and wild pitch, he eventually got out of it unscathed. With Greinke still in the game, that led to JT facing him a fourth time and jumping on a first-pitch curve, bombing his 11th dong of the year to left for the 3-2 lead. Stay hot. That left things for Kenley Jansen, who is still the closer despite getting lit up since returning from the DL. Obviously it’s not really his fault, as he LITERALLY HAD HEART PROBLEMS, but it’s hard not to be skeptical about his readiness. Things didn’t start ideally, as he got an out but on a ball that was scaled to center. That was quickly evened out, as Kenley got unlucky when he made a quality pitch on the outer half only to have a nubber bloop in behind first for a double. To the relief of basically everybody, Kenley then rebounded with a strikeout and then induced a sawed-off grounder to end it. Not even September yet, but it sure as hell felt like they had to get this one. The Dodgers are now 73-62 on the year. Most importantly, they are now in second place in the NL West, leap-frogging the Rockies (lost) and are just one game back of the Diamondbacks. Tomorrow is gonna be a hell of a game, as Clayton Kershaw matches up against Patrick Corbin at 3:10 PM HST/6:10 PM PST/9:10 PM EST. On one hand, Kershaw. One the other hand, Corbin is a good lefty and the Dodgers have been struggling to hit any lefty.